Previously, we brought you Ernest Hemingway’s popular story 'The Killers' and a historical perspective that fills in many gaps. Today, thanks to research and the skills of Robert Lopresti, we bring you its precursor that possibly explains why 'The Killers' may have pursued the Swede. Hemingway’s 'A Matter of Colour,' published in the April 1916 issue of The Tabula during his junior year of high school, may be forgiven its twist, clever in its own way. Indeed, this story demonstrates the skills of the teenager who'd become one of America's most famous writers. 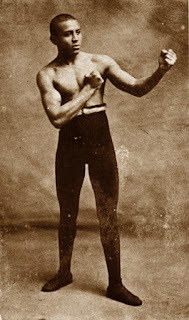 Two weeks ago, we learned Joe Gans was historical, a real fighter, the first black World Lightweight Champion. We also discovered Andreson, the Swede, was patterned after Andre Anderson, who'd once knocked Jack Dempsey off his feet, later killed by the Chicago mob for blowing a match. “What, you never heard the story about Joe Gan’s first fight?” said old Bob Armstrong, as he tugged at one of his gloves. “Well, son, that kid I was just giving the lesson to reminded me of the Big Swede that gummed the best frame-up we ever almost pulled off. The yarn’s a classic now; but l’ll give it to you just as it happened. “Along back in 1902, I was managing a sort of a new light-weight by the name of Montana Dan Morgan. Well, this Dan person was one of those rough and ready lads, game and all that, but with no footwork, but with a kick like a mule in his right nn, but with a weak left that wouldn’t dent melted butter. I’d gotten along pretty well with the bird, and we’d collected sundry shekels fighting dock-wallopers and stevedores and preliminary boys out at the old Olympic club. “Dan was getting to be quite a sizable scrapper, and by using his strong right mitt and stalling along, he managed to achieve quite a reputation. So I matched the lad with Jim O’Rourke, the old trial horse, and the hoy managed to hang one on Jim‘s jaw that was good for the ten-second anesthetic. “So when Pete McCarthy came around one day and said he had an amateur that wanted to break in, and would I sign Dan up with him for twenty rounds out at Vernon, I fell for it strong. Joe Gans, Pete said, was the amateur‘s name, and I’d never heard of him at that time. “I thought that it was kind of strange when Pete came around with a contract that had a $500 forfeit clause in it for non-appearance, but we intended to appear all right, so I signed up. “He stuck out his right mauler, and there, just above the wrist, was a lump like a pigeon egg. “Say! I could have thrown a fit. It was so blame simple. We just couldn’t lose, you see. It comes off so quick nobody gets wise. Then we collects and beats it! “So I goes out and pawns my watch to put another twenty down on Dan to win by a knockout. Then we went out to Vernon and I hired a big husky Swede to do thc slapstick act. “The day of the fight dawned bright and clear, as the sporting writers say, only it was foggy. I installed the husky Swede back of the old drop curtain just behind the ropes. bell rings for our show. "Well, the gong clangs and Dan rushes the smoke up against the ropes, according to instructions. “Nothing doing from behind the curtain! I motioned wildly at the Swede looking out through the peephole. “Then joe Gans rushes Dan up against the ropes. Whunk! comes a crack and Dan drops like a poled over ox. “Holy smoke! The Swede had hit the wrong man! All our kale was gone! I climbed into the ring, grabbed Dan and dragged him into the dressing room by the feet. There wasn’t any need for the referee to count ten; he might have counted 300. Oh, ouch. I wouldn't have voted him Most Likely to Succeed, would you? I'm forced to ask if I could have written that well at that age. I was reasonably erudite, but that was the problem, inculcated with Victorian overwrought writing and Latin school run-on verbiage– all those bad habits I had to unlearn. Today's Orlando Sentinel carries an article on federal government overreach at the Hemingway museum, where descendents of Hemingway's 6-toed cat Snowball live. After sending in undercover investigators, the USDA has successfully claimed the cats are performers subject to the same regulations as circus animals. Leigh, your background work is fantastic. And KUDOS to Rob for getting the story to you! I, for one, really enjoyed the chance to get a look behind the scene. I agree about taking age into consideration when looking at the story. From reading the writings of my kids, and their friends, I've gained quite a bit of exposure to high school-aged writing, and think this is a pretty darn good job for a 16 or 17-year-old. Rambling though it may seem, when viewed from our contemporary setting: I’d point out that he gave us a pretty good idea of the mannerisms and foibles of the characters, all in 915 words – a brevity that often escapes the teenaged writer. I don't count Hemingway among my favourite authors, but did enjoy this particular short story. ABA and Dixon, thank you. I have to admit I'm finding some of Louis' points persuasive. I'm also leaning toward Hemingway's use of the 'N-word' in The Killers more as an artifact of its place and time rather than Hemingway's personal view. In this story, he refers to Joe Gans as 'the smoke', not only less offensive, but kind of an intriguing handle for a boxer. Hmm… float like smoke, sting like blazes. There is a scholarly journal called The Explicator whose entire purpose is to publish one or twopage articles presenting new insights into literature. Every issue has a piece explaining one line of a Shakespeare sonnet or a stanza of Emily Dickinson. If you are the first person to spot the conectio between COLOUR and KILLERS, it is very publishable. No money, but wouldn't you like to be a certified scholar? It would certainly shock my professors! I am sorry to suggest that the connection is probably false. Hemingway is known for his accuracy and love of detail. He wrote this story in April 1916 and Andre Anderson fought his first fights in 1915. In 1916 he was rather unpopular (probably until his fight with Jack Demspey in Dec 1916). Besides, the story in A matter of colour takes place in 1902, so that would make Anderson 12. 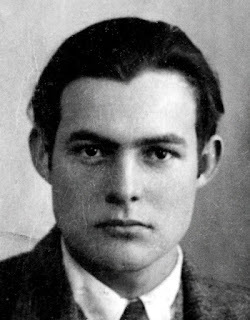 If you combine all those facts, it is (1) unlikely that Hemingway heard of Anderson (2) Unlikely that he would not take his age into account (3) Hemingway would probably characterize a boxer as a boxer not a person behind the curtain who is hired to hit someone with a piece of wood. Cross the T's and Roll the "I's"